An RPG meets Farming MMO Klondike is set in the Old West, a time of new frontiers and expeditions to seek out fame and fortune, our character starts out on a search for their own missing father who went missing on one such expedition. Following clues to his last known whereabouts players find themselves in a rundown settlement and are greeted by local Inuit who are willing to help rebuild the settlement, and so the journey begins. Free to play the game will offer story driven content as well as reward based activities for buying, growing and trading all types of items and produce to advance in the game, and it is all accessible through your internet browser. 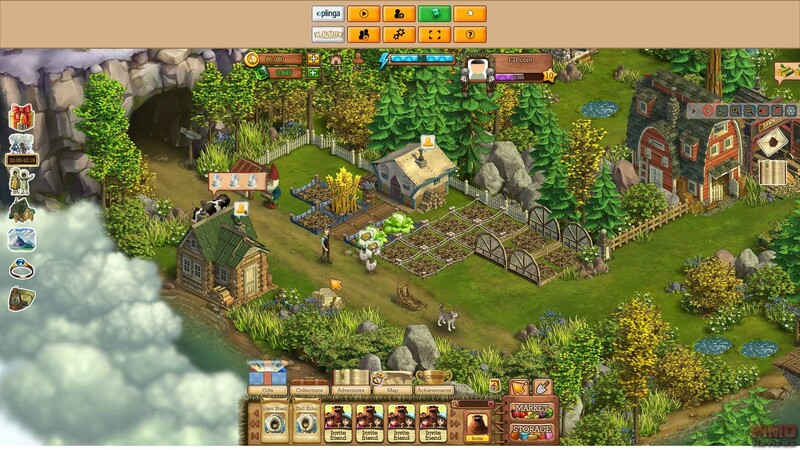 The core gameplay of Klondike revolves around a traditional farming MMO, players will have to clear up land, plough flower beds to plant seeds and raise various crops, these can be sold for Gold on the market or used and combined with other items to create other tools and objects that are needed. The design gives players full self-sufficiency providing them with the basics to get them started, but as players gain XP for nearly every action they perform they will level up and gain access to new structures, items and content as the game steadily progresses. Players can work together or compete in friendly rivalries, but all have their own personal story-arc that they can advance with the game offering a variety of more features than other traditional farming games. Throughout the game players will be required to obtain various items for different uses, this could be as simple as making Chicken Feed to feed the chickens, which will require tending a flowerbed, buying rye and bean seeds, planting the crops then harvesting them and finally combining them in the barn to make the new chicken feed item. Other items can be things such as fabrics, tiles and timber that may be needed to build up a structure for a new Smithy or Spinnery, these new buildings allowing players to create other items. Different items come from different places, some are obtain in their base form, whereas others are only accessible if players combine certain items to make them. Early on players will be able to get access to a variety of base resource items from clearing the grounds of their settlement, cluttered with rocks, trees, bushes and grass these items not only provide resources when cleared, but they also open up space to build. Clearing items like this uses up Energy, without Energy players can’t perform such actions and so will have to rest and let it replenish or purchase food to give themselves huge Energy boosts. There are numerous goals in the game, aside from competing with other players to have the best settlement, some work towards trying to be a leader in the community by providing items on the market or helping other players. Alternatively players may have an Achievement seeking personality in which they want to get all the Collectibles, unique items that come in sets where if players find all the items in a particular set they will gain a bonus. These items can be traded with other players or gifted to them (often in the hope they will gift back a Collectible you are looking for), or players can head out on Expeditions to find them. Expeditions allow players to take their dog sled and head to other areas on the map, reaching these areas has expedition requirements with certain gear and provisions, but when there players can harvest some rarer and more valuable resources, find other unique Collectibles, and progress the story of the overlying story-arc. The dog sled can only carry so much weight and so players will constantly have to head back and forth between these distant areas and their home settlement to reap the benefits of their finds. Looking for more Free MMO Browser-based games,Free MMO management games,Free MMORPGs,Free MMOs games?